Here's a guide that will help you get your specific Hero Traits through re-rolling. You can re-roll a hero whenever one of them dies, it's free with new looks and stats given to the new hero. How to Re-roll: Remove gears from your hero, select a dungeon with 1 torch requirement, farm some Soul and Gold if you want but let him/her die there. Select the "Give Up" option to start re-rolling. *For each 10 Hero Levels you can unlock a powerful Hero Trait. Here's some notable talents that you might also want to consider when choosing Hero Traits. You can further enhance a Hero Trait by unlocking certain talents from the Talent Tree. - Increases Warrior's attack damages. - Strength also gives bonus Health (HP) to your clan. - Increases Rogue's attack damages. - Dexterity also gives bonus Critical Hit Chance to your clan. - Increases Mage's attack damages. - Intellect also gives bonus Mana (MP) to your clan. You won't lose your gears, but the Lvl of the new hero will just get about half of the hero who died. Class and stats (STR, DEX, and INT) will be the same, depending on the new hero's Lvl. - You can re-roll for free if you just let your hero die. This is recommended if you are just starting out, use your Torches to do hero resets instead of Gold. Save your Gold for other upgrades you might need. - If you "Give Up" a fallen hero at higher levels, this time you might want to use Gold to re-roll. - If you are lucky, you might even get a higher Lvl hero than what is normally offered. - Here's an example to let you know why re-rolling is important to get the Hero Traits that will fit your play-style. - The first thing you need to do is to get the Main Weapon that you would like to use for your Rogue. For this example, I chose Bow as my Main Hand weapon. Now, once I level up my Rogue to Lvl 20, and unlock the 2nd Hero Trait, the Trait will now start to give my Rouge a nice boost to his Bow attacks. 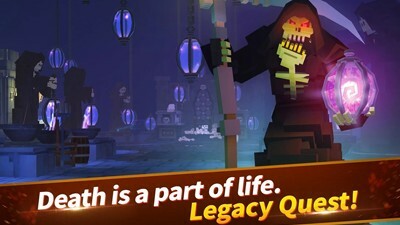 - Hero Lvl 10, Any will do. - Hero Lvl 40, Any will do but preferably, I would like to get a Hero Trait that enhances either Poison or Lightning. Why? because Poison and Lightning are under Path of Mastery (DEX+), a talent path suitable for Rogues. 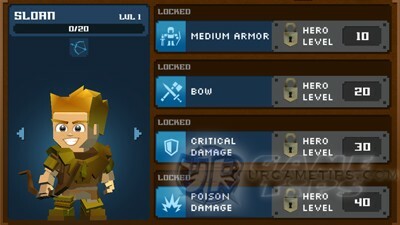 - So to sum it up, what I need now based from the screenshot above, is to get a Bow that has a Poison Attribute to maximize my overall attack damages. - A Bow with Poison attribute: Boosted by Lvl 20 Hero Trait (Bow) + Lvl 40 Hero Trait (Poison Damage) + Lvl 4 Poison Damage increase from the Path of Mastery (DEX+) = Great Damages! - Like I said above, Lightning is also good for Rogues, the others are acceptable but you might need to upgrade other Talent Path to unlock the attribute that you are aiming for. - There is an exception though, if for example, you played a Mage hero before and unlocked the "Lvl 4 = Fire Damage increase" from the Path of Illumination (INT+), then it's also ok to get a Fire Damage attribute for your Rogue.